If the term skirmish is a little alien to you in wargaming, I’ll give you the skinny. When you think Warhammer 40K you might thing a conference table plastered with scenery and huge armies. Tonnes of models clogging a landscape in the name of dominating warfare. Skirmish games shy away from this to provide a typically smaller, more manageable game. 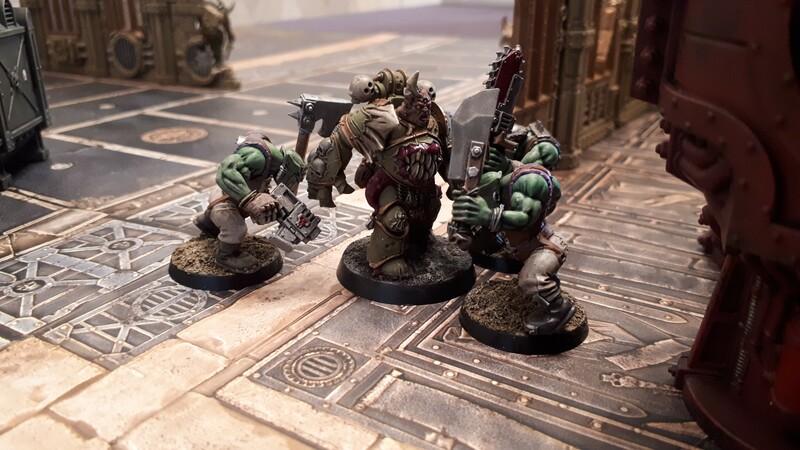 Kill Team is no different with players typically taking between 3 – 10 models. This, of course, means fewer models to buy needing less time to paint. 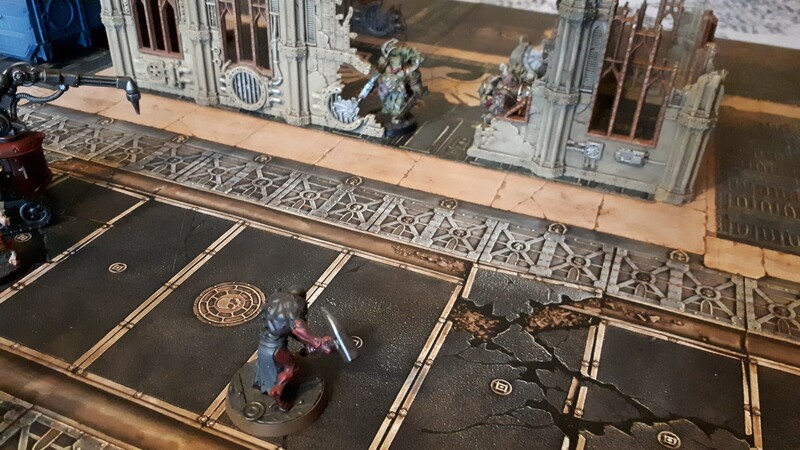 Kill Team runs with this as an almost ideal starting point for 40K initiates. One box of Primaris Marines or Genestealer Cultists and you’ve theoretically got all the models you’ll need. Included in the box are some coloured sprues for some Adeptus Mechanicus Skitarii troops along with some Genestealer Cult Neophytes. The models themselves aren’t new but are sensible additions to the box with plenty of loadout variety. Also worth pointing out, with the sprues being red for AdMech and grey for the Neophytes, Games Workshop has embraced coloured plastic with open arms. Shadespire has certainly contributed to that. Of course, whilst there’s a couple of factions in the Kill Team box, there’s plenty of existing factions compatible with the game. 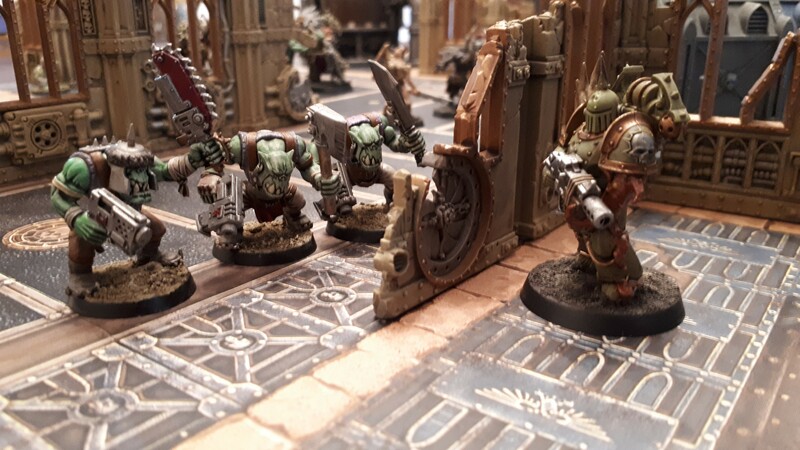 My Death Guard will be seeing some skirmish bouts, likely facing off against some Carcharodon Primaris scum or some atypically smaller Ork hordes. With the rules most 40K factions being included in the core rulebook, this will likely draw in a large audience right off the bat. However, some factions are somewhat inhibited by what they can take. Whilst it’s typically sensible, sometimes the lack of variation might fail to stimulate some players desire for their faction. Also in the box are some of the brand new Sector Imperialis buildings which appear to be the highlight of the box. Based heavily on the old Cities of Death from Games Workshop, these new buildings offer a new level of modularity and elevation in games. I see no reason they couldn’t be used in regular games of 40K on top of Kill Team. They’re also compatible height-wise with the recent Sector Mechanicus releases. This retro-fitting consideration is a bigger deal for myself as I pride myself on setting up beautiful battlefields. This makes it all the more possible. With the buildings in the sprue sculpted in various states of ruin and grandeur, there’s innumerable options. This alone has made me fall just a little head-over-heels for the Kill Team box. Take A Look, It’s In The Book! The Kill Team box comes with the core manual with all the rules needed for Kill Team. It’s been made apparent that this will be a fully supported standalone game system which will have expansions coming in the future. Sometimes, knowing that a product is seeing long-term investment can just make a purchase feel safer. Less likely to have the box gathering dust in months time. Again, perhaps they’re applying their learnings from Shadespire? In fact, this game has had design insights from the minds behind Shadespire itself. This will hopefully support claims that the game will be balanced, supported long-term and highly enjoyable. The rules don’t immediately shriek echoes of change or wheel reinvention. The 40K gameplay bread and butter are there with initiative phases, movement phases, shooting phases, etc. It’s by no means as inventive as Shadespire in comparison, but it feels like a safe entry into Warhammer 40K. Whilst I confess that someday I hope for a Shadespire-esque entry into Warhammer 40,000 with its own entirely bespoke game system, I won’t bat away Kill Team just yet. There’s fun new twists in there akin to Shadow War such as models falling off of edges, leaping over gaps and even a Scouting Phase. The Scouting Phases allows players to potentially set traps or preemptively strike out at their enemy forces. It’s a welcome addition and whilst it can be risky, sometimes setting the tide of battle before it starts can vastly turn plans on their head. 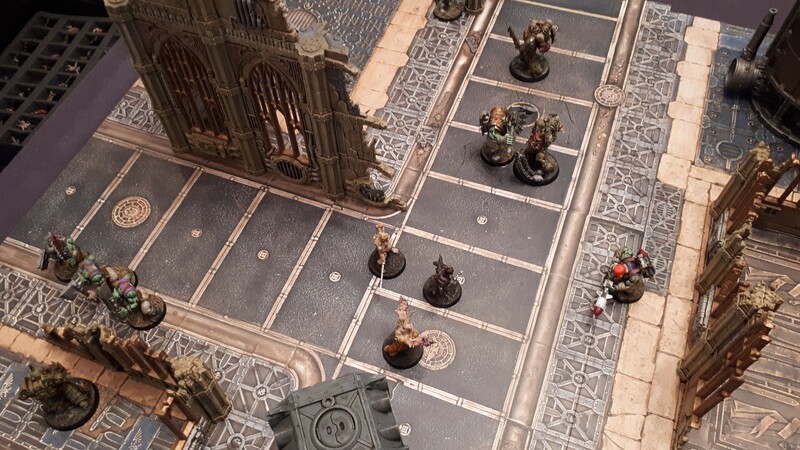 Kill Team also sees a now-prevalent system of Command Points brought into it from 40K-proper. These Command Points can be accumulated and be spent on tactics which can offer re-rolls, special abilities per faction and numerous other things. Whilst I can say that these Command Point systems are getting somewhat saturated across 40K, Age of Sigmar and now Kill Team, it’s hard to complain too much. They may not be brand-spanking new on the scene, but they work for what they do. 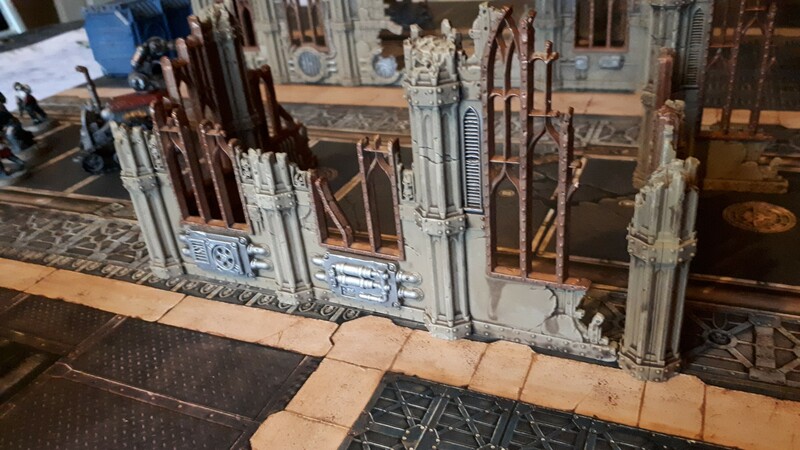 A particularly fun element of the game, alongside playing with your Kill Team, is building it to begin with. Each faction is restricted to what models and weapons they can run with alongside their specialisms. It’s fun to finally be able to field a semi-functional Chaos Space Marine acting as a sniper. Or even fielding an Ork Gretchin as the brain, bossy leader of a gang of huge, green thugs. There’s a challenge squeezing your desired models and their equipment into a battle-forged list of 100 points. But a huge aspect of building your team is the amount of options and flavour Games Workshop have offered for personality of your fighters. You can generate quirks for your squad, their background or reason for fighting. You can even determine the demeanour of your specialists and the overall mission of your Kill Team in a campaign. These totally optional but happily implored can really add a personal level to your combatants. Emotionally investing in small, plastic space elves just got all the more alluring. It’s never really going to impact gameplay but for those who play with a narrative focus it will be a colossally welcomed inclusion. Naming your fighters is, of course, recommended. “Daz” the Ork Loota is no doubt grinning at the thought of the upcoming scrap with some Space Marines. Building your Kill Team and bringing your Kill Team to life are clearly two different things and can mean a world of difference depending on your investment. Should you decide to play campaigns then your fighters can continue to improve and hone their skills. Specialists unlock new skills on skill tress tied to their specialisms. This role-playing game element is yet again something I’m delighted to see. Kitting your demolitions specialist out to profess at booby-trapping terrain is an example that surmises it quite nicely. The longer your specialists survive, the more they can offer and do for you. There’s the chance that they might end a fight out of action and end up being killed outright for good. This risk is no new part of these skirmish soirees, but it’s still exciting. We’re going to need to roll some more dice and mimic some more machine gun noises and orcish grunts before I can offer a final verdict on Kill Team. I can tell you that reading the book got me incredibly keen to build up teams of fighters I’d never consider otherwise. I’ve also always been a fan of the smaller games, personally. I’m happier playing many games in one day than a single large game. There’s nothing profoundly new here and as stated there’s no jaw-dropping surprises. However, it seems that I didn’t realise how badly I’d missed playing 40K skirmish until it came walking by yet again. Maybe this time it’ll stick around for good? As ever, for more on all things tabletop and wargaming, stick around our Facebook page for all the latest news and updates. 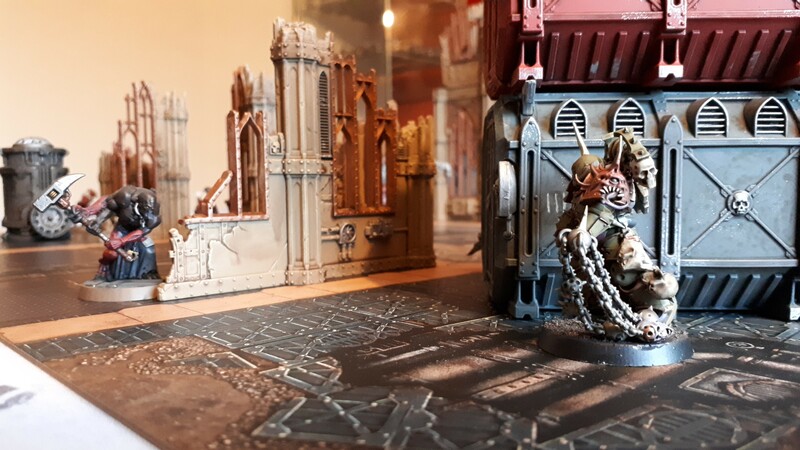 Should you wish to pre-order Kill Team you can do so here from Element Games.